As the NHL grows younger, the Calder Trophy race gets tighter each season, and the 2018-19 campaign won’t be any different with a handful of rookies ready to make noise. Five rookies from four different countries highlight the immediate field of contenders, each with his own skill set and expectations as all but one prepare for their first taste of NHL action this season. Being the first overall pick comes with a lot of pressure. When such a pick is a defenseman—widely accepted as the hardest position to learn in the NHL—that pressure builds. Add in the increased expectations of immediate performance and a fan base eager to put losing in the past and suddenly it may seem like everything is on one player. That’s the position Dahlin finds himself in with the Buffalo Sabres, a team looking to break the 90-point barrier for the first time in eight years. Dahlin is heralded as a game-changer and future Norris Trophy winner. He possesses a high hockey IQ and has the ability to make his teammates better for the rising Sabres. Listed at 6-foot-2 and 181 pounds, Dahlin is still filling out, which is understandable for an 18-year-old. The Swede is a tremendous skater, allowing him to join the rush and control the defensive zone, where he plays an intellectual and physical game beyond his years. 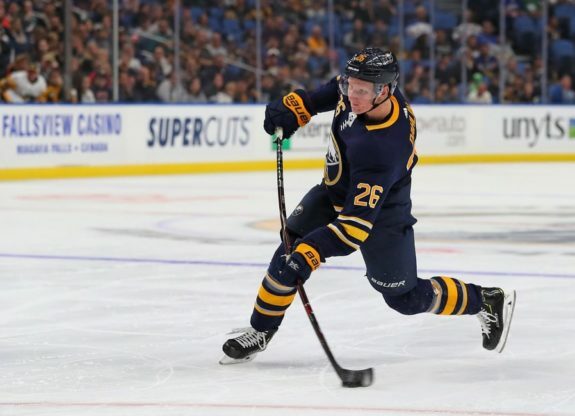 He’ll have a lot to learn on a smaller ice surface against the best players in the world and should post fair offensive numbers with the likes of Jack Eichel, Jeff Skinner, and Sam Reinhart around him. Pettersson showed he could handle himself against bigger, stronger opponents in 2017-18 after setting the record for most points by an under-20 player in the Swedish Hockey League (SHL). His 56 points (24 G, 32 A) in 44 games led both his team and the league, even as he missed time for the World Juniors Championship. He added another 19 points (10 G, 9 A) in 13 games as he helped the Växjö Lakers capture their first league title. Now, on a smaller ice surface in a new continent, Pettersson and his exciting promise will be tasked with helping the Vancouver Canucks rebuild after a string of success and Stanley Cup contention. Questions have been raised about the 19-year-old’s defensive game, but that’s usually the case for young players. 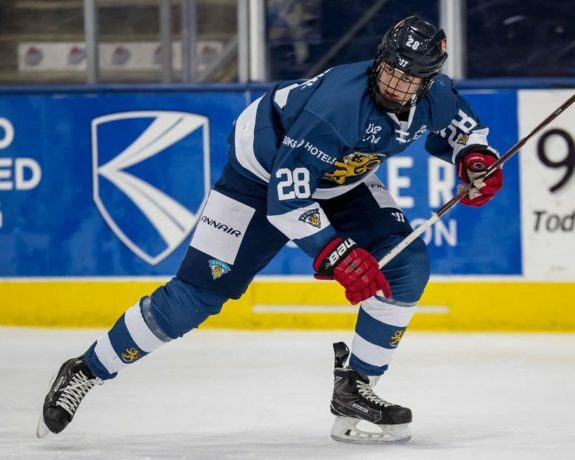 Pettersson enters the NHL a tad gangly, standing at 6-foot-2 and 176-pounds, but natural progression and support will help him stay relevant offensively. Country-mate and former Canucks captain Markus Naslund envisions a smooth transition for Pettersson. 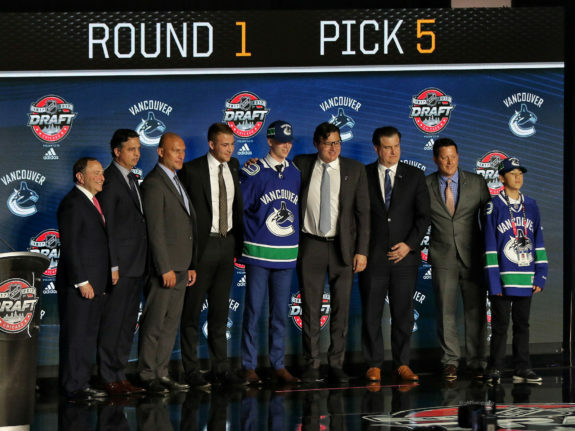 He will likely start his rookie season alongside Brock Boeser and Bo Horvat, two big pieces for the Canucks during their rebuild. The duo will be tasked with helping ease Pettersson along as the team enters a season without Henrik and Daniel Sedin for the first time since 1999-00. Svechnikov got his first taste of North American hockey in 2017-18, where he set the Ontario Hockey League (OHL) ablaze. He led all rookies with 40 goals and 72 points on his way to being named the OHL Rookie of the Year. Don’t let the 25th-place finish in league scoring fool you, as the Russian played in just 44 games while the 24 players ahead of him skated in an average of 19 more games. With 40 goals in 44 games, Svechnikov consistently displayed elite talent, ending the season with a 23-game point streak and 11 more points (5 G, 6 A) in eight playoff games. When Sportsnet’s Daniel Nugent-Bowman asked him what makes him so successful, the 18-year-old wasn’t coy. His all-around game and finishing ability is something the Carolina Hurricanes have lacked over the last several years, and the lack of such attributes is a large reason for their current nine-year playoff drought. With a blossoming star in Sebastian Aho and other high-end propsects in the organization, Svechnikov can help lead the team into the future and should be a huge key for a team many have picked as a postseason sleeper in 2018-19. By far the lowest draft pick on this list, as well as the oldest, Donato earns this spot after getting a taste—and taking a bite—of the NHL at the end of the 2017-18 season with the Boston Bruins. The 22-year-old started his 2017-18 journey with a second straight 20-goal and 40-point NCAA season at Harvard University. It started a whirlwind of success for Donato. He recorded 43 points (26 G, 17 A) in 36 games with Harvard before the Massachusetts native added another six points (5 G, 1 A) in five games with Team USA at the Olympics. He then signed his entry-level deal, joining the Bruins for a season-ending 12-game stretch, where he recorded five goals and nine points. Donato’s small taste of success will go a long way out of the gate, as will a strong Boston team with legitimate superstars and proven winners. 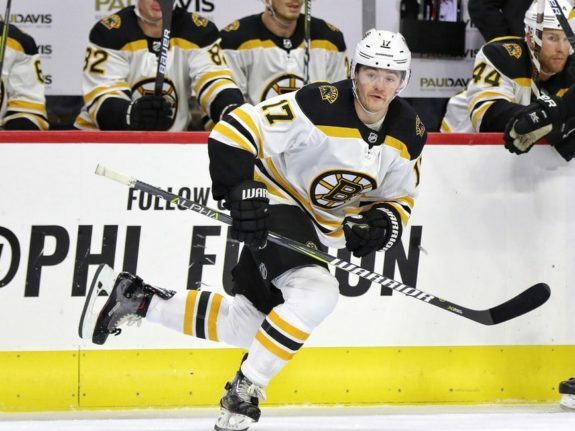 Donato will likely be the consistent winger that second-line center David Krejci has missed in recent years, and his nose for the net will be elevated with Krejci’s playmaking. Related: Will Donato Drown In Bruins’ Youth Depth? A strong first season would help offset a sophomore slump—or two—from the Bruins’ multiple rookies from last season. Some will call it deserved, others desperation, as the Montreal Canadiens remain one of the biggest question marks entering the season. Kotkaniemi’s stock soared ahead of June’s draft as he was pegged as the top center, a position sorely lacking in Montreal. He was “over drafted,” but has already shown flashes of his future. Kotkaniemi is still a real talent. His all-around game has been compared to that of Anze Kopitar, a two-time Stanley Cup winner and arguably the best two-way center in the NHL. Before the preseason, the 18-year-old was unfamiliar with the North American game, having spent his career in Finland. Needless to say, he’ll have to learn a lot on the fly. After a strong showing during exhibition play, where he scored three points (1 G, 2 A) in five games with a plus-5 rating and four shots, Kotkaniemi earned praise for his compete and poise against NHL stars. He’ll need to learn quickly in the faceoff circle, however, as he went just 16-for-41 (39 percent). Kotkaniemi is somewhat of a dark-horse rookie, but with talent around him in Jonathan Drouin, Max Domi, Artturi Lehkonen, and Brendan Gallagher, he may shed that label soon.